Positive Discipline: What is Positive Discipline? 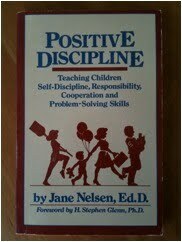 I wrote and self published Positive Discipline in 1981. Can you believe that cover? I did it myself--not enough money to hire a cover designer. :-) You should see how ridiculous it looks on the inside (which I also did myself, before the advance of word processing). Much to my surprise, the first 2,000 sold within one year, so I printed another 5000--again gone in a year. So, I hired a book designer for the next printing of 10,000. In six years I had sold over 80,000 copies as a self-publisher when Ballantine discovered the book and began publishing Positive Discipline in 1987. 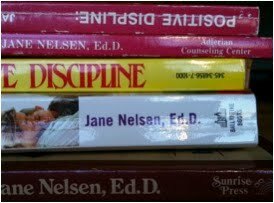 It has now sold more than one million copies--and I have written many other Positive Discipline titles with several co-authors. I am so excited by the growth of Positive Discipline. There are so many wonderful people all around the world using Positive Discipline in their daily lives. Our Positive Discipline Network is growing every day and I see people encouraging and helping each other apply the principles of Positive Discipline. Each week I receive an email from Google which lists all the websites mentioning the term Positive Discipline. Often these websites grossly misrepresent the basic Adlerian philosophy of treating children with dignity and respect. How can they possibly justify any form of punishment as "positive"??? Even when they talk about "logical consequences," what they describe in poorly disguised punishment. Just this morning I received a Google notice of a blog titled "Tips for Effective and Positive Discipline Strategies". The blog post was filled with references to praise, consequences and punitive time-out. It even had a YouTube video of the SuperNanny teaching a very punitive way of using time-out with a toddler. 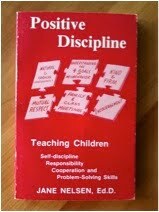 But contrary to the blog title, the article had very little to do with the original Positive Discipline. Recently my son sent me a flyer that my granddaughter brought home from school. The flyer announced that they would be using a Positive Discipline approach at her school. Below is an exact quote from the flyer. "A positive discipline approach is followed including praise, and rewarding class and table points redeemable within the regular classroom in conjunction with their reward system, and, where necessary, support of the school's specialty teacher discipline program: should severe misconduct occur, a reminder to follow the rules will be given; if a second reminder is necessary, the student will complete a "behavior log;" a third similar misbehavior will result in a phone call to the parent/guardian and will result in notification of the student's other teachers; should the behavior continue, more severe consequences, such as missing another specialty class, or referral to the office, will occur; those who cannot follow the procedures will also lose computer time for the period." Let me be very clear that this is NOT Positive Discipline. Many people fear that if they stop using punishment, praise, rewards--the only alternative is permissiveness. In the original Positive Discipline, we make it very clear that permissiveness is not healthy for children and does not teach inner locus of control for responsibility, cooperation, and problem-solving skills. Because so many people wonder, "What else is there if you give up punishment and rewards? (Behaviorism), we have developed 52 Positive Discipline Tool Cards that summarize the hundreds of alternative discipline methods discussed thoroughly in the Positive Discipline books. If you believe in the Positive Discipline methods, please help us educate people who are misusing the term. Feel free to share the "What is Positive Discipline" link. Make comments on blog posts and share your own experiences with Positive Discipline. Help educate the staff at your children's school. Together we can help maintain the mutually respectful concepts of Positive Discipline so that our children will learn the valuable social and life skills necessary to be contributing members of society.